Built mainly by local voluntary labour, the Temperance Hall at Drumkilly opened in 1907. It is said that stones from the church that once stood at the end of mill lane were used in the construction of the hall. Over the years, the hall has been used by the pioneer movement, Foróige Clubs, drama groups, traditional musicians and local bands. Concerts, bazaars, badminton classes, dances and musical evenings have also been associated with the hall, which has been in existence for more than one hundred and ten years. Drumkilly Development Group has spent the past few years renovating Drumkilly Hall. Fundraising efforts in the local community have enabled the installation of a new roof, new toilet facilities, a new kitchen, a modern stage, new doors, new windows, a new ticketing office, a new entrance and much more. On Saturday, 5th May 2018, the newly renovated hall was blessed by Fr Micheál Quinn and was officially reopened by RTE’s Midlands Correspondent, Ciaran Mullooly. A large crowd assembled for the occasion. The hall is now available for various events, including church events, classes, concerts, local meetings and community gatherings after funerals. 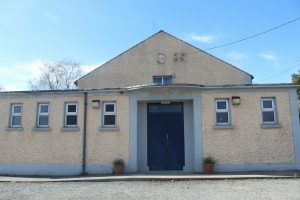 The hall in Kilnaleck was built in 1931 as a Temperance Hall under the auspices of the pioneer movement. Through time, the hall became parish property and was used primarily for dances, meetings, card games and concerts. The local ‘Senior Citizens Group’ held their first gathering in the hall in 1987. This in turn led to the establishment of ‘Kilnaleck Social Services’ in 1988. The organisation expanded rapidly and it was soon realised that the facilities at the hall could no longer fulfil the needs of the community. 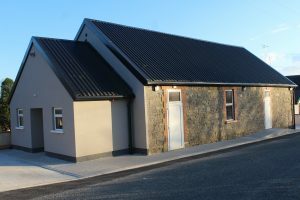 The organisation relocated to the clubrooms of Crosserlough GAA. The hall is still being used today by local community organisations and groups for a variety of events, including concerts, dances and drama.